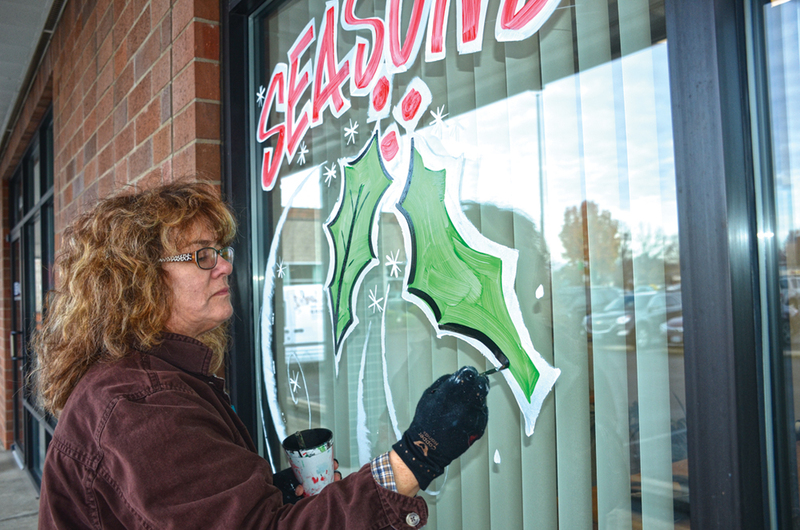 Sandra Palmer rolled through Keizer on Monday, Dec. 4 to spread the spirit of Christmas in a unique way: holiday window-painting. Palmer runs a henna shop in Seaside, but goes south every winter to paint Christmas scenes and slogans on the windows of local businesses. This is Palmer’s first season painting in Keizer. One of her favorite subjects to depict is Frosty the Snowman, often adding a twist to fit the theme of the business it’s painted on. She adorned the Keizertimes office with a Frosty holding a rolled up newspaper. “Over at Nancy’s, he’s holding a burger and shake,” Palmer said, punctuated with a laugh. Palmer starts with a white base for every window, a technique she learned by trial-and-error to help with the contrast of her colors. She goes back and forth along the window, adding each layer of color one at a time. “I don’t fool around with too much detail,” Palmer said, preferring to trust her instinct and experience to shape the final product. Palmer started henna tattooing five years ago, after two separate occasions of being approached while painting windows by individuals who suggested she should do henna. She looked into it and began teaching herself by watching YouTube videos. “It was like I had a knack for it,” she said. Palmer’s shop in Seaside is called Five Star Henna, and she encourages anyone with an interest to stop by next time they visit the Oregon coast. “I started out that summer with a little table, now I have a 1,300-square-foot building in Seaside,” she said. In its first league dual of the season, McNary continued to show something you can’t coach—tenacity. Behind five pins and two technical falls, McNary defeated McMinnville 40-30 at home on Thursday, Dec. 7. At 195 pounds, McNary sophomore Randal Nordberg earned a pin just before the buzzer sounded on the first period to give the Celtics a quick 6-0 lead. “I was very hyped,” said Nordberg, who has started the season 3-1 after a knee injury ended his freshman campaign early a year ago. He credited his teammates for the turnaround. In his first match at 220 pounds, Blake Norton then pinned Juan Contreras, a district placer, in the third period to stretch the Celtics lead to 12-0. 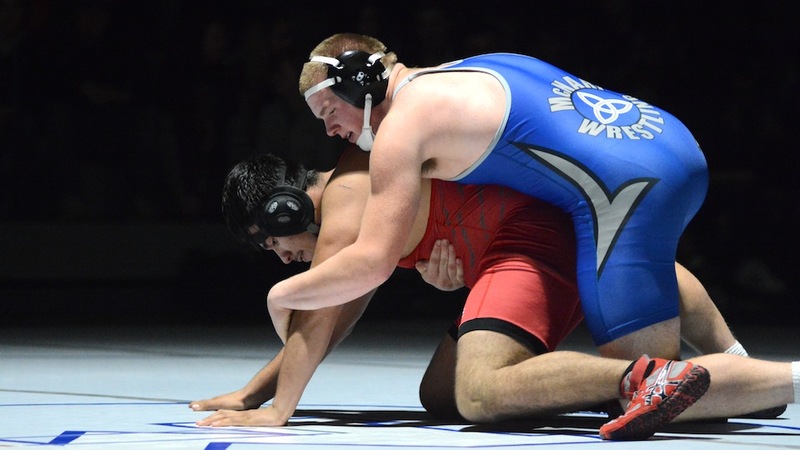 After losing the heavyweight match, McNary continued to pad its lead in the lightweight divisions. At 106 pounds, freshman Grady Burrows pinned his opponent in 17 seconds. At 113 and 126 pounds, Tony Castaneda and Austin Moore, two wrestlers with high school experience who missed last season, both earned technical falls to give the Celtics a 28-12 lead. “It’s good to have Tony back in the lineup,” Ebbs said. “He’s been out for about a year. He’s had previous success and he’s trying to find his groove again and today was a good opening for him. McNary junior Enrique Vincent took care of business at 132 pounds, pinning his opponent in 33 seconds. But with two close wins at 132 and 138, McMinnville began to cut into the Celtics lead and a pin at 160 got the Grizzlies within 34-27 with two matches to go. However, McNary senior Brayden Ebbs (170) was able to stop the momentum, pinning his opponent in the first period to secure the team win for the Celtics. McNary is competing in a six-way tournament in Silverton on Saturday and then goes to South Salem on Thursday, Dec. 14 at 5 p.m.
Until a few days after Thanksgiving, Danielle Bethell wasn’t sure that the Keizer Chamber of Commerce’s Keizer Holiday Lights Parade was going to live up to her expectations. 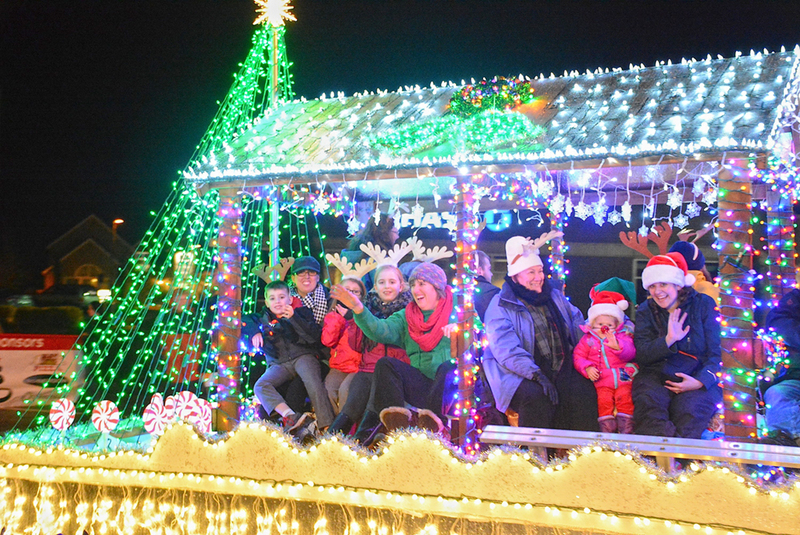 The Keizer Holiday Lights Parade sponsored by the Keizer Chamber of Commerce and the City of Keizer arrives on River Road North Saturday, Dec. 9, at 7 p.m.
“We’ve had a number of groups and organizations sign up that haven’t been part of the parade in the past,” she said. The line-up for the parade features several big name entries that are taking part for the first time. Newcomers include Comcast, Budweiser, Salem Electric, United Rental, Mallorie’s Dairy. Band entries include McNary, South, Sprague and McKay high schools as well as The Beat Goes On. The theme this year is Wrapped Wishes. Bethell said it was a take on they way she viewed the toy catalogs that arrived around the holidays. “We would go through those catalogs and have everything circled by the end. We called them Wish-Me book. Christmas Day we got to find out which of those wishes was under the tree,” she said. Bethell is eager to see how parade entrants interpret the theme. The Grand Marshal of the parade will be Gerry Frank. Frank, until recently, was owner of Konditorei in Salem. 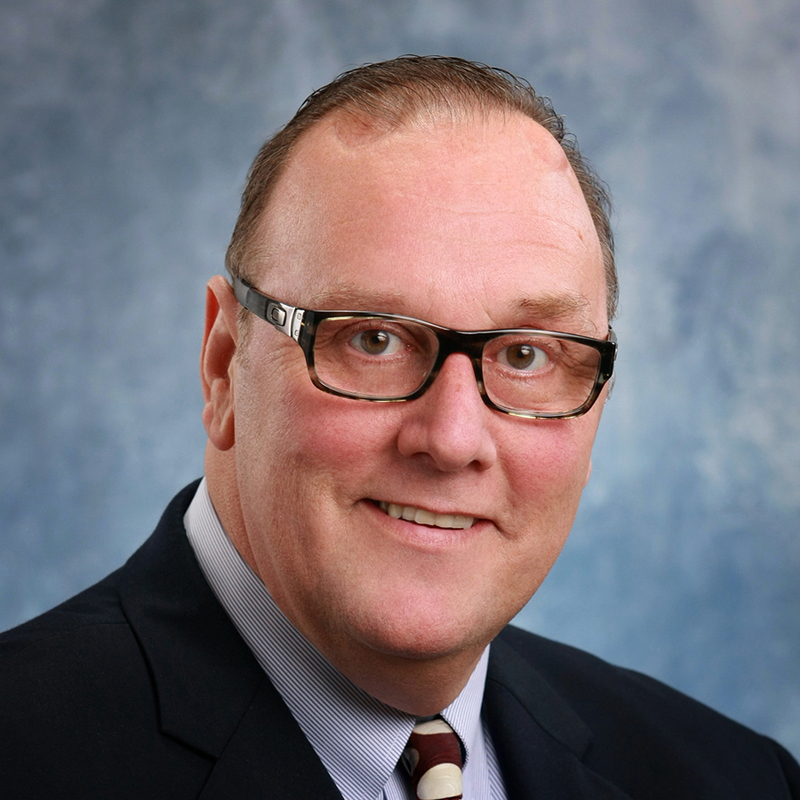 Frank has deep roots in the retail, restaurant, political, civic and business activities of the state and is also an author. “He’s a fan of all things kids and, when we talked about getting somebody to represent our target audience, Gerry was the logical choice,” Bethell said. In addition to the parade itself, the Chamber has enlisted several partner vendors offering food and drink during the parade. Willamette Valley Bank, Yenne and Schofield, and Copy Cats will offer warm drinks as part of the event. The St. Edward Latino Youth Program will be serving up tamales. Lakepoint Community Church will have free cocoa at Remodeling by Classic Homes. Franz Bakery of Portland will serve grilled cheese bites at JC’s Pizzeria. El Patron will serve tacos, quesadillas and Mexican hot chocolate. Staging for the parade begins at 3:30 p.m. on Lockhaven Drive North between McClure Street N. and River Road. The parade will start at the intersection of Lockhaven and River Road and travel south ending at Glynbrook Street North. River Road will close at 6 p.m. To make way for the Chamber’s annual Jingle Dash, a 5K fun run, which begins at 6:15 p.m. The run will begin at JC’s Pizzeria, 4200 River Road N. Cost is $17 to $37 for youth, depending on the day of registration, and $27 to $37 for adults. Registration can be completed on the Chamber website, www.keizerchamber.com. Participants are encouraged to dress up and compete for the best costume award. Cookies, hot cocoa, and coffee will be waiting at the finish line. Salem-Keizer School Board members agreed at a special meeting Monday that the proposed school improvement bond should stay within $620 million. A recent survey discussed at the meeting showed that district voters were particularly concerned about more space for music classes and more services for special education. It was agreed that staff should look for ways to shift some money from other items to those areas, to safety measures, and to more space for Junior ROTC. Michael Wolfe, district chief operating officer, noted concerns about having enough space for science classes and said there was enough flexibility in classrooms now available to provide the needed space. Wolfe added that the staff would look each year at expansion needs generally for growth in full-time equivalent enrollment. Lisa Harnisch, co-chair of a political action committee promoting the bond proposal, said her committee had found most people receptive to approving a bond. “Does the concept meet your vision for growth of the school?” Positive 70 percent, negative 19 percent, other 12 percent. “Does this concept support your child’s learning?” Positive 77 percent, negative 10 percent, other 13 percent. “Does this concept support your child’s safety?” Positive 69 percent, negative 11 percent, other 20 percent. Question 1: Positive 18, negative 12, other 1. Question 2: Positive 24, negative 6, other 0. Question 3: Positive 26, negative 1, other 5. Some parents in the McNary area responded with comments. Parents of McNary students urged more room for the orchestra, negotiation with St. Edward’s Church for more land, and moving the softball field to the area that has been proposed for parking. A Gubser Elementary School parent called for more classroom space and a better place for the orchestra. Another Gubser parent urged moving the cafeteria to the southeastern part of the campus. A Kennedy Elementary School parent called for making a seismic upgrade the highest priority and for replacing older portable classrooms. The bond vote is scheduled for the May 2018 ballot. 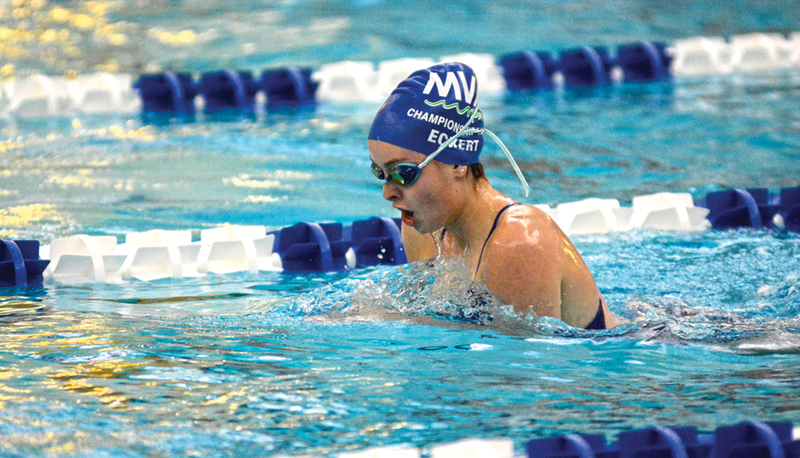 McNary’s swim team came up short in its first dual meet of the season, falling to Forest Grove on Thursday, Nov. 30 at the Kroc Center. The girls’ standings were the closest with the Vikings edging McNary 93-71. Alyssa Garvey, Emma Garland, Emily Alger, and Haley Debban won the 200 yard free relay in 1:54.53. Debban finished second in the 50 free in 27.25, followed by Garvey in third in 27.66. Freshmen twins Alex and Bella Beard were limited due to a club meet the following weekend but were still able to make their mark. Alex won the 100 backstroke in 1:08.48. Bella and Alex also took first and second in the 50 free junior varsity race in 27.40 and 27.53, respectively. McNary’s boys, which lost 101.5-58.5, were missing club swimmers Kyle Hopper and Harrison Vaughn. Grant Biondi, Brock Wyer, Wyatt Sherwood and Jabez Rhoades won the 200 free relay in 1:44.32, edging Forest Grove by less than a second. Lewin was also impressed by McNary’s times in the 50 free JV race, which should add depth to the boys team. Nikita Martushev won the event in 26.26. Collin Wentworth took second in 27.25 and Ethan Whalen placed third in 27.94. The Celtics next host Sprague at the Kroc Center on Thursday, Dec. 14 at 2 p.m. It has been a few years since we first visited the Career and Technical Education Center (CTEC) on Portland Road in north Salem. Initially, there was residential construction and welding classes only in the massive building. Now, hundreds of students from Salem-Keizer high schools are taking classes in manufacturing, engineering, cosmetology, auto body repair and painting, and—most stunning—drone technology, robotics and video and game design animation. These are classes that prepare our students for tomorrow’s jobs. Salem’s CTEC is the first public-private partnership of its kind. Dozens of tours each month show off the center to educators from around the state and around the nation. Innovation, thy name is Salem-Keizer. The Career and Technical Education Center is preparing students for high-skill, high-wage, high demand careers while developing the skills, technical knowledge, academic foundation and real-world experience to assure their success once they graduate. At full strength CTEC will educate about 1,100 students. The students will travel from their home high schools. Aside from the technical classes students are also taking classroom courses in science and math that correlate to the skill they are learning. For example, home construction students take math to learn about angles and ratios, the type of math used in construction. The Career and Techinical Education Center is exciting for everyone. Students are engaged (their graduation rate is above average), the teachers are focused and committed. Principal Rhonda Rhodes and the other CTEC leaders can hardly contain themselves when discussing the center. Some political moments are like an X-ray—revealing down to the bone. Here were Senate Republicans, poised for their first (and only) real legislative victory of the year. Tax overhaul, they knew, would be their main shot at shaping public perceptions of the GOP in the Trump era. The bill they were in the process of passing was utterly typical of Republican economic thinking—large tax reductions for corporations, broad income-tax relief for individuals and an increase in the child tax credit (deductible against income taxes). None of this surprising in the least. Which was a problem. Insofar as blue-collar voters in places such as Pennsylvania and Ohio delivered unified Republican government, you would think their economic needs and struggles might find some central, or at least symbolic, place in the Republican agenda. So when Sens. Mike Lee, R-Utah, and Marco Rubio, R-Fla., proposed an amendment to make the child credit fully deductible against payroll taxes (which are the taxes actually paid by the working poor), it was clearly good policy and good politics. The measure ended up getting only 20 Republican votes and was defeated 71-29. How is this for symbolism: In their tax bill, Senate Republicans gave a break to private jet owners, but refused to increase the corporate rate by 0.94 percentage points to cover the cost of helping an estimated 12 million working-class families. The 20 percent corporate rate, Rubio and Lee were told, was sacrosanct, nonnegotiable—until the day after the vote, when President Trump conceded it may need to rise anyway. What drives many elected Republicans to embody every destructive, plutocratic stereotype? Do they really need to wear spats and a top hat every time they appear in public? A good case can be made for reducing the corporate tax rate below the 24 percent global average, making America a more competitive place to do business. And it is true that, in a progressive tax system, broad tax cuts will go disproportionately to people who pay a lot of taxes in the first place. But Senate Republicans were presented with a clear and conservative way to both seem and be more favorable to working-class families. And they rejected it decisively. It was foolish of Senate Republican leaders not to see the obvious political benefit of this change to a bill that is currently unpopular. It was offensive that most Senate Democrats voted against the amendment, on the crassly partisan theory that nothing they oppose should be improved. It is even a bit disappointing that Lee and Rubio did not threaten to blow up the tax bill —any two Republican senators plus Bob Corker, R-Tenn., an announced “no,” could have done so—in order to get their amendment included. It is true enough that many liberals would only be happy with tax-code changes that are frankly redistributionist—designed to decrease inequality, even if overall economic growth were undermined. They think of the tax code as one way of addressing a structural injustice—the injustice of modern capitalism, which favors wealth over wages. In contrast, compassionate conservatives (the few of us who remain) view healthy, sustained economic growth as a moral achievement—justly rewarding effort and enterprise and allowing society to be more generous to those in genuine need. (What poor and stagnant nation would undertake Medicaid or the President’s Emergency Plan for AIDS Relief?) But this is different than saying that economic freedom is always identical to the common good. Particularly in an increasingly high-skill economy, it requires positive effort to (1) train as many people as possible for economic participation, (2) ensure that lower skill work can still result in a dignified life (through measures such as the earned income tax credit), (3) encourage the stability of families (through, for example, the child credit) and (4) increase the scale of private and religious efforts to meet society’s desperate human needs (addiction, homelessness, etc.). The goal of a compassionate conservatism is not economic leveling but social solidarity—an economic system that allows everyone to live lives of dignity. On the best historical and economic evidence, this is achieved through a mixed economy—allowing the freedom to create wealth, but depending on government and civil society to humanize an imperfect human system (as all human systems are imperfect). The balance here is not always easy to determine. But most elected Republicans don’t seem moved or motivated by either equality or solidarity — at least if the damning defeat of Lee-Rubio is any indication. Number 16, Abraham Lincoln, wisely pontificated more than 150 years ago that one cannot fool all the people all the time. However, we’ve got number 45 president now who’s doing quite well at fooling something between 30 and 40 percent of them. His tactic is the use of “fake news” to have his way with these folks. So does the fake news syndrome bother you, the reader here, or you don’t mind if truth and accuracy become quaint and irrelevant? A whole lot of the fake news controversy started with Donald Trump’s adversarial relationship with the press. His diehard supporters heartily devour the “fake news” claims he makes every day now but these same folks claim also that they never trusted any news in the first place. Yet, there are those who think the president is doing lasting damage by way of his dumbed-down tweets by condescending to his followers, making enemies of the press and vilifying the system of checks and balances the press provides, important enough back when to be number one in our Constitution’s First Amendment. Meanwhile, mainstream media, and the public’s opinion of it, has been at a low point for years and continues to be. A Gallup poll in September 2016 found that American’s trust and confidence in the mass media “to report the news fully, accurately and fairly” had dropped to its lowest level in polling history with only one in three of Americans polled saying they have even a fair amount of trust in the media. And that level was down even from the previous year. During Trump’s candidacy he was given inordinate attention by the media, receiving what some assessed as blanket coverage for most weeks of his candidacy. Initially, journalists embraced him and his ratings were a bonanza for cable news. Then came his inauguration and thereafter, with Trump receiving more negative coverage than his predecessor, Barack Obama, his time in office has been marked by far more missteps, often self-inflicted, actually than any presidency in memory. But it’s Trump’s use of Twitter, his bypassing the press and communicating directly with the public, that’s viewed as unprecedented: twittering used by him like a bull-horn of inaccurate White House propaganda. His crude take-downs, threats and his lies have proven not only outrageous and never-ending, but idiotic, too. The bottom line though is that he’s a cagey fellow who feeds his core supporters: in a divided nation where voters live in alternative political universes, it remains to be seen what happens to a 230-year old democracy after his off-the-cuff, gut-spawned, and supporter-bamboozling becomes the end for truth. Trump is manipulating media in disruptive maneuvers and one of his victims is trust in the media. What Trump is doing may have been what other presidents wanted to do, but, it’s surmised, didn’t think they could get away with it such as Trump has generally succeeded to date. Thomas Jefferson wrote during his presidency, “Were it left to me to decide whether we should have a government without newspapers or newspapers without government, I should not hesitate a moment to prefer the latter.” The translation: Jefferson as president had strong disagreements with the press but recognized the importance and value of the media. Trump, it’s argued, does not respect this view and, if not talking to himself, takes advice from destructive forces the likes of Steve Bannon and others like him who want to nuke our Constitution, institutions, values and way of life. When a large part of society starts to believe that real truths cannot be found, they tend to grow cynical about everything and instead, as history discloses in multiple examples, put their trust in one person such as is true of Russia’s Vladimir Putin. Putin, who it’s believed Trump admires and seeks to emulate, does not have to convince Russians he’s telling the truth; no, he must only force-feed his people into accepting that everyone else is a liar. Object to Putin and certain death follows. Truth died in Russia under Joseph Stalin’s U.S.S.R. while it’s an established fact that Putin was one of his most loyal followers, a higher up in the K.G.B. The view this writer holds dear is that our nation, and its serious efforts at developing a working republic through democratic principles and practices, depends upon an informed citizenry where its sources of information are trusted as factual because its people are confident in how information is collected and processed. When the public does not have trust in the media to keep them informed, truth in absentia, on which daily life and public interactions are foundational, presents a clear and present danger. When a huge and growing segment of a nation’s population surrenders itself to a leader who seeks absolute, authoritarian rule, as examples abound form the 20th century, then there’s soon a violent end to freedoms and civil rights.